What do you mean, ‘safe word’? This is another piece from the Vienna Schatzkammer, which will have to do instead of my usual word torrent. I’m out tonight. Normal service resumed tomorrow. Here’s the collection of the whips that Katherine Anna of Austria used on herself. She was a minor member of Austria’s royal family who lived in the 1600’s. Presumably she sat around someone’s palace doing needlework and whipping herself until she was married off to a minor prince somewhere. I haven’t been able to find out much about her: she didn’t trouble history, much. 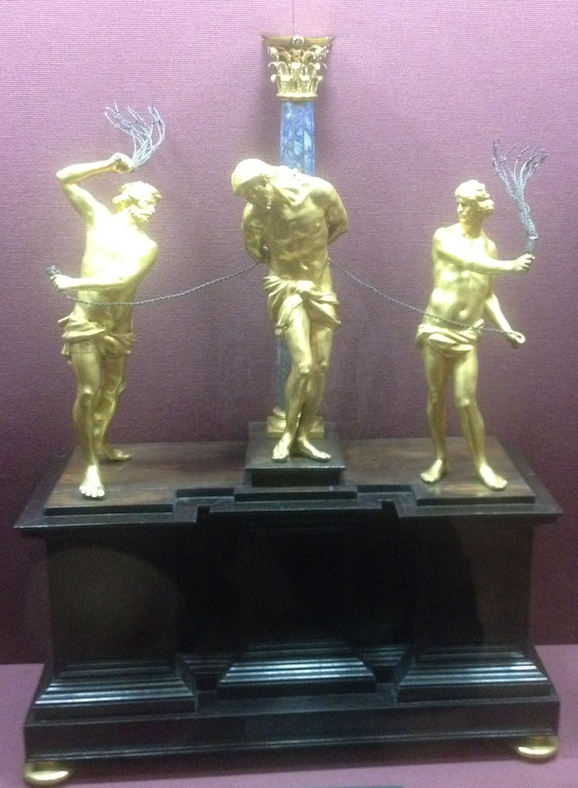 Her collection of scourges, for whipping herself when she felt she was a bad girl, is kept in the Schatzkammer, or Imperial Treasury, in the Hofburg Palace in Vienna. It’s not a very good photo, because the whips were behind glass in a darkened room, but I hope you can see enough to note that her whips were quite lovingly made. They have decorations, but they also have metal tips. Any of them would have hurt, and you’d have to be careful not to draw blood. I doubt if she was careful. This is, I guess, one of the benefits of religion: it licences extreme states of consciousness and sensuality, while providing spiritual rhetoric as a framework. Katherine Anna is likely to have been “protected” from knowledge about sexual feelings in women, and at the same time told that women are the most licentious of all creatures, who have to keep their sexual urges firmly curbed. Being a good and faithful believer, she’d reach for the scourges when her thoughts became troubled. Perhaps she thought about a servant in tight breeches, and the curve of his buttock and upper thigh. In any case, the scourge hurt for the first few lashes, as she swung it over her own shoulder to cut into her bare back. Then endorphins kicked in to cover the pain. She can feel her mind ease, as the pain starts to recede and pleasurable feelings replace the pain. She is presumably staring up at a three-quarter likeness of a near-naked man, bound with nails to a post with a cross-bar. She looks into his wooden or marble eyes, and sometimes at the muscles of his belly and thighs. He seems to stare back at her, sharing her pain. She has partially bared her body for him, so that she can reach her bare back to apply the whip. She hardly dares wonder if he likes what he sees. And then she feels a racking moment of great joy: her troubled thoughts, her pain, everything, recedes for a few seconds while her body shakes. Oddly, after that moment of sweet, spiritual reward, she feels no further sexual desire, for a while. She puts the scourges away. She’ll need them again, soon enough.